Harpoon can separate any geometry into separate parts by region (ie contiguous sections) or by feature angle. These parts are then used in the exports. All names are conserved in the output. Parts may be mirrored in X, Y or Z directions. Triangles may be added, deleted or merged to improve the imported geometry. Imported parts may be scaled, translated or rotated if required. Imported parts may be deleted, merged or renamed. 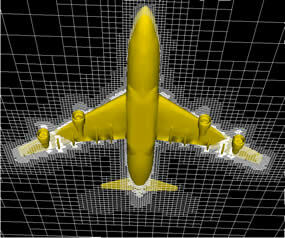 Intersecting geometry can cause problems when meshing. Harpoon can automatically generate intersection lines to help improve mesh quality in these regions. Harpoon can detect and display holes in the imported geometry. These can be automatically filled using a proprietary algorithm. Feature lines may be added, deleted, split or merged. Different angles may also be chosen for their creation. Boundary layers can be created on a per part basis. The visibility of Parts mapbe turned on/off. Only visible parts are meshed. This is useful when studying the effects of changes in geometry. Harpoon allows the hexas to be stretched in X, Y or Z. This can give a dramatic reduction in the number of cells required. Refinement regions (boxes/spheres/trapezoids) can be used to control the volume size in specific regions. Harpoon offers global slow or quick expansion rates from one hexa level to another. Expansion of more than 2-1 never occurs. A more complex expansion is possible from any part, which penetrates the volume much more. This is useful for leading edges of wings, for example. Harpoon produces hanging nodes but these can be removed for those solvers that do not support them. Harpoon may be run in batch mode. Different regions of elements can be grouped into volumes which can then be edited on a macroscopic scale. Volumes can be deleted or merged, and any individual elements affected will be updated accordingly. Similarly, surface meshes can be merged together. After meshing, individual volumes may be coarsened in the X, Y or Z directions. This can give a 10%-40% reduction in cell count. Harpoon gives users the ability to smooth generated meshes to a specified quality criterion. Some solvers struggle with extremely skewed elements, so the user has the option of specifying a limit to the ‘skewness’ of the cells. Harpoon can be used to highlight which individual cells are of poor quality. Users can then interactively move the nodes of problem cells and see how this affects the quality of the cell and those around it. In a mesh that may contain millions of cells it can be extremely difficult to locate missing elements or ‘leaks’. Any leaks will play havoc with solvers so it is vital to find them. Harpoon can find these by a proprietary scanning method which displays the route taken through problem holes. It is possible to compact the mesh to reduce the RAM required before saving or creating Boundary Layers. 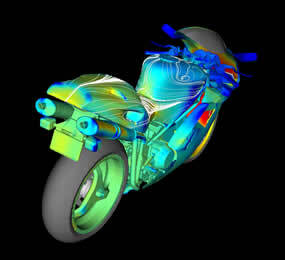 CFD/ FE solvers have evolved throughout the world to run on a dizzying array of platforms, but meshing technology has not kept up. Harpoon is one of the few meshing applications available today that runs on a Mac. A 64-bit AMD Opteron version is also available. Multi-part assemblies can be navigated logically through the parts hierarchy, a dedicated section of the GUI. A Native file format may be saved. The format is machine independent. Cells may be added or deleted. Cells may also be manually adjusted or automatically smoothed with a new improved smoothing algortihm. Surface meshes may now be cleaned automatically. Harpoon will search the surface for bumps and other irregularities and attempt to resolve them. Harpoon can now choose between the first or last geometric part in creating the surface mesh when it encounters overlapping geometry.